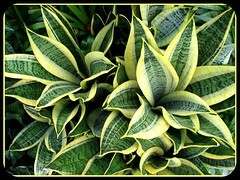 A very attractive sport of Sansevieria trifasciata ‘Laurentii’ (Goldband Sansevieria), with appealing variegated foliage in a rosette-like formation and delightfully miniature in stature. I think this is one of the most beautiful Sansevierias that I’ve ever seen. 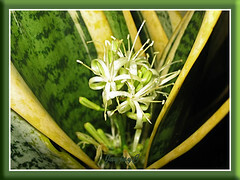 Common Name: Golden Birdnest Sansevieria, Golden Bird’s Nest Snake Plant, Golden Birdnest Goodluck Plant. Plant type: Indoor or outdoor ornamental plant, native to Africa, Arabia and India. Soil: Grows best in well-drained loamy soil, though adaptable to any kind of soil. Propagation: By division of suckers. 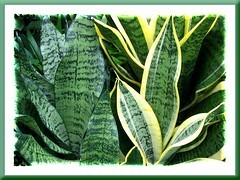 For variegated Sansevierias, propagation by division is the choice to retain the golden yellow variegation. It can also be propagated from leaf cuttings taken from the parent plant, but since ‘Golden Hahnii’ is a chimera like other variegated Sansevierias, it will not propagate true to type, resulting in the absence of gold bands on the edges of the leaves. Desiring to see this outcome for real, I took a leaf cutting, divided it into 3 sections and then pushed them with basal ends down into loosened soil. The plantlets that emerged eventually did not have any golden margins at all, as seen in this image of the plants on the left side. Usage: Great as a houseplant in various kind of containers, not only for its attractiveness but also for cleansing the air in the home of benzene and formaldehyde concentrations. Ideal for outdoors too in mixed planters, garden beds, borders and xeriscaping. ‘Golden Hahnii’ are perfect as groundcovers, especially in mass planting with other low-growing plants, such as Dwarf Mexican Petunias and Zephyr Lilies, etc. 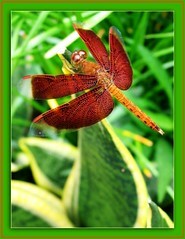 to attract butterflies and dragonflies. Care: S. trifasciata ‘Golden Hahnii’ is such an easy-care plant, almost thrives on neglect. Just know that it absolutely dislikes soaked feet, but loves the sun and warmth. So, plant it in well-drained loam-based soil and be very careful never to overwater, otherwise it’ll succumb to rot. Though a tough survivor in a wide range of conditions, be it in the hottest sun or the deepest of shade, it performs best in good light or sunny locations. Exposure to prolonged low-light conditions will result in long, lanky leaves that are featureless, lacking in good shape and coloration. Feeding is unimportant, but if you’d like to, fertilize with a low-nitrogen fertilizer sparingly during the growing season. If necessary, thin overcrowded clumps with a garden spade and propagate the divisions elsewhere, as overcrowding will distort new rosettes. It’s hardly bothered by pest or diseases. For temperate regions: Hardiness: USDA Zone 9a-11. Avoid cold and wetness, but provide good light and warmth. Well-drained soil is essential. Water moderately in summer, but keep it dry during the winter. 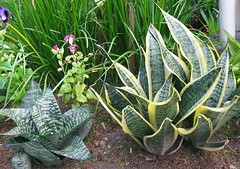 To know more about sansevieria’s culture, refer to fact sheet by International Sansevieria Society and Dave’s Garden site. Just a short flowering spike of 16.5cm in length, but its beautiful flowers are a sight to behold, especially at dusk when they shine to their utmost best and release a very pleasant fragrance that will make you crave for more! Simply astonishing! 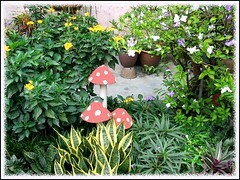 Nice healthy plants….I wish you have more varieties. If you have can you share the pictures. I also collect sanse and i am planning to share it to all. I am still waiting for my digicam. Thanks. Thanks, Ed G! 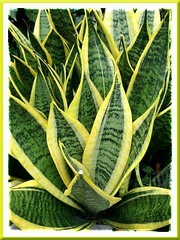 Currently, we grow only 4 species of Sansevieria, as included in our plant directory listed here. Just click on the named sanse. species in that list and it’ll lead you to plant profile and more pictures if you’re interested. I apologize for the spelling, the program performs a translator, I do not know English. Us in the school of the Russian language was required. photo. Very beautiful, desktop size of seedlings. I started looking for a flower shop, a web shop, but sold nowhere. Thee, therefore, dare to turn in a request. From your message, Marika, I gather that you’re requesting for a young plant, right? If so, I’m sorry, we can’t comply as we’re not a nursery or garden center. Search elsewhere, please. Nevertheless, thanks for your blessings and you’re wished the same.